You won't find an off-the-shelf woofer in any JL Audio home subwoofer because designing and building superior subwoofer drivers lies at the core of our passion for audio. The company has developed proprietary electromagnetic and suspension analysis systems and invested heavily in state-of-the-art testing and manufacturing systems. 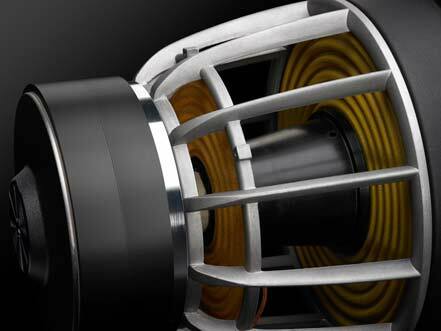 JL Audio's intense focus on research has borne subwoofer driver designs widely considered as reference standards for linear displacement and dynamic stability. The Fathom subwoofers sacrifice nothing, thanks to the dynamic advantages of their proprietary JL Audio woofers. These exceptional drivers allow for a true subwoofer passband and very high output, while keeping distortion well below audible thresholds. To extract full benefit from the excursion envelope of its woofer, each Fathom employs an exceptionally powerful switching amplifier with a large toroidal transformer and a patented circuit designed to enhance control and fidelity. Simply put, Fathom is the compact subwoofer system for those who enjoy demanding program material and won't settle for compromises. The challenges associated with designing a high-output subwoofer can be quite daunting. In most cases, designers sacrifice low-frequency extension or output capability to keep the design of the enclosure small. This is not the case with JL Audio subwoofers! The woofer used in all of JL Audio's is entirely of their own design, and is completely manufactured by them in Miramar Florida! In fact, the ten inch woofer utilized has seven patents in the design alone! All of the controls for adjusting the JL Audio F-110 subwoofer are conveniently located up front. No more kneeling down with a flashlight and using a mirror to make adjustments! In addition, there is an exclusive Automatic Room Optimization circuit or ARO for short. ARO allows the user to easily and reliably calibrate the subwoofer to ensure a smooth and accurate response, even in challenging rooms! 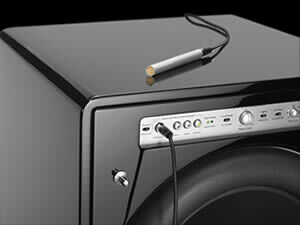 It is as simple as plugging in the supplied laboratory-grade microphone and pressing one button! The subwoofer takes over and does the rest! The 900 watt RMS amplifier used in this subwoofer is again, entirely of their own design, which features a large toroidal transformer and a patented circuit to enhance control and fidelity. Simply put, the JL Audio F-110 subwoofer is a compact subwoofer for those who enjoy demanding program and won't settle for compromises! For many enthusiasts; searching for a subwoofer that is both powerful and accurate that works equally well for both home-theater as well as two-channel music systems appears to be a nearly impossible quest. With the new JL Audio F-112 subwoofer that quest has been achieved! The 12 inch driver that the subwoofer utilizes has the longest excursion of any previous woofer for deep, tight, room-filling bass that will have you grinning from ear to ear every time you listen! The subwoofer is driven by an incredibly powerful 1500 watt amplifier that features an extra large toroidal transformer and a patented circuit to enhance control and fidelity. All controls to make adjustments for the JL F-112 subwoofer are located on the front of the unit; so no more reaching behind the subwoofer with a flashlight to make adjustments! There is a unique feature called Acoustic Room Optimizer or ARO for short. This allows the user to easily optimize the subwoofer's response in even the most challenging rooms. This is accomplished by using the supplied microphone and simply pressing one button and the subwoofer does the rest! The subwoofer's high-gloss cabinet is finished with seven coats for lacquer and hand-polished to a beautiful mirror-like finish. All JL Audio products are engineered and manufactured in the US in Miramar Florida! An accurate and powerful subwoofer that will enhance the performance of any audio/video system can be yours with the JL Audio F-112! When was the last time you experienced a movie with bass that was so powerful you felt it? From the sensation of the cannon shots from the movie "Master and Commander", to the attack of kick pedals on a drum solo, the new JL Audio subwoofer is something that has to heard and experienced! The 13.5 inch high excursion woofers used in the F-113 will deliver tight, deep and powerful bass that is unrivaled with other woofer manufactures' designs. The 13.5 inch woofer is so evolutionary that it currently has seven patents it its design! To power this incredible woofer is a 2500 watt amplifier that features a massive toroidal transformer and a special patented circuit for even better control and fidelity! 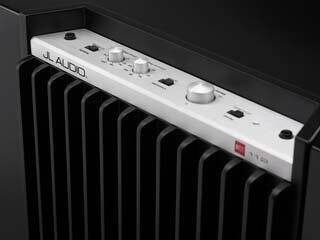 JL Audio subwoofer systems incorporate a clever piece of technology called Automatic Room Optimization or (A.R.O.) for short. The A.R.O. system self-generates a series of calibration tones, measures the response at the listening position, analyzes the shape and magnitude of the primary response error and configures an appropriate filter to tame it. The system effectively allows for smooth, well-balanced sub-bass from a variety of locations that may have been less than ideal. Incredibly powerful and accurate bass that will enhance the performance of any audio or home-theater system. The new JL Audio F-212 subwoofer is designed to pressurize larger listening areas and deliver a performance on both audio and home theater that must be experienced! You won't find an off-the-shelf woofer in any JL Audio home subwoofer because designing and building superior subwoofer drivers lies at the core of their passion for audio. 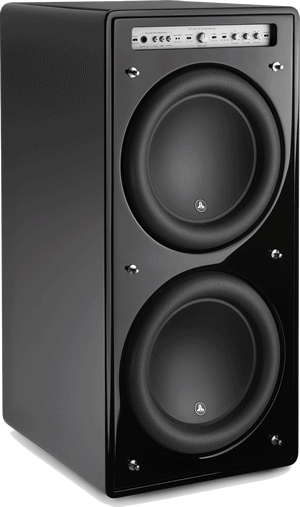 The Fathom f212 belongs in the top-rank-Class A-of "Recommended Components." The new JL Audio E-Sub series powered subwoofers apply a series of their key technologies to deliver exceptional sound quality, power and value in a wide range of demanding applications. Combining a state-of-the-art, DMA-optimized long excursion driver with a highly efficient, proprietary switching amplifier, the E-Sub deliver a level of performance that belies their compact dimensions and cements their value. and individually performance-verified and tested to deliver years of listening enjoyment in your home audio or home theater system. It has always been said achieving accurate and deep satisfying bass has always been elusive for many subwoofer manufactures out in the market today. Sure; most subs will deliver a cool effect when playing the latest blockbuster film on Blu-Ray. The explosions of an interstellar battle cruiser can sure sound exciting enough; however when the same subwoofer is asked to play music; the enviable let down occurs, until now; usher in the subwoofer offering from the bass gurus at JL Audio. 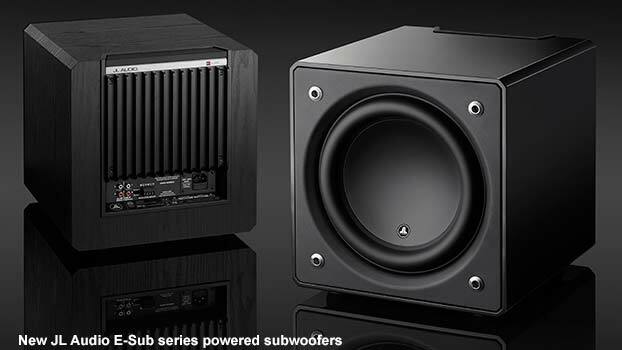 Introducing the new E Series subwoofer, the E-110 and E-112. 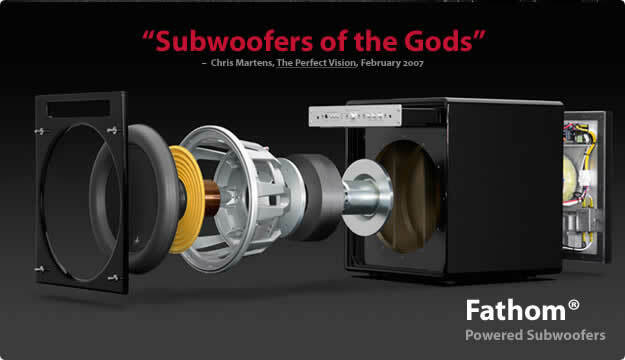 JL Audio took the audio world by storm with the Fathom Series of subwoofers, with many accolades, (and awards), from virtually every highly respected magazine publication. The woofers utilized in JL Audio subwoofers are not "off the shelf from that guy" drivers. The woofers used in JL Audio subwoofers are exclusively manufactured in JL Audio’s own factory located in sunny Miramar Florida. In fact, their woofers currently have over seven patents on the driver alone! JL Audio not wanting to rest on their laurels, decided to create another subwoofer line, so now everyone can enjoy musical and accurate bass, with gut-wrenching power and output that everyone loves!Instead of taking the easy way out and simply "reverse engineer" their Fathom line to fit into a price point. 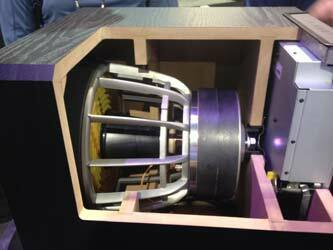 They decided to create another entirely different, (and equally impressive), woofer for the new E-Series line. JL Audio wanted to shake up the industry and make the best subwoofer they could possibly manufacture, but at a lower price. How did they do that? Let’s take a look. The DMA long excursion driver in the E-110 and E-112 is an entirely new driver that took JL Audios engineers many years to develop. 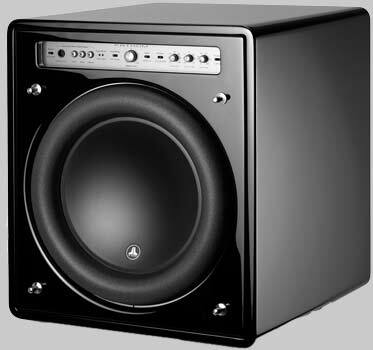 This driver offers nearly three inches of excursion in a sealed cabinet that delivers the most accurate bass response, compared to other manufactures that will cheat by porting or using passive radiators. By using a sealed cabinet, JL Audio was able to optimize and keep the woofer under control, without the issues of using ports that normally create unwanted noise with air moving in and out of the cabinet. Using a sealed cabinet does have one drawback however, it is less efficient, JL Audio has addressed this by utilizing a powerful 1200 watt digital switching amplifier. Digital switching amplifiers when implemented correctly have many advantages of high power, and efficiency, and they do not have any issues with overheating; perfect for this application! Every adjustment for the E-110 and E-112is located right on top of the cabinet for easy access for fine-tuning the subwoofer for optimum performance. No more getting on your knees with a flashlight and hoping that you are moving the right control for the proper adjustment. Many companies will take the easy way out by attaching the amplifier and crossover controls on the back panel to save costs. Not with JL Audio! The new JL Audio E-110 and E-112 subwoofer rewrites the rules about what is possible with high-quality subwoofer bass performance for both Home-Theater and stereo music reproduction. This subwoofer would make for a perfect choice to greatly add a whole new dimension to your music and improve the bass performance of virtually loudspeaker system. The JL Audio subwoofers integrate seamlessly to give you the impression that the bass is coming from the loudspeakers, not the subwoofer itself. This is the ultimate compliment that you can give a sub-bass system, and the JL Audio subwoofer lineup does this beautifully! We have both the new E Series, as well as, the Fathom series of subwoofers on display here at The Stereo Shop, come on down and prepare to be amazed what a high quality subwoofer can do to any system!